Author Paul Bezanker is a music historian and author. He published Connecticut Rocks! 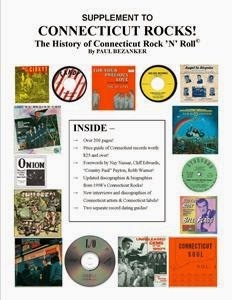 – The History of Connecticut Rock ‘N” Roll In 1998 and most recently he has released the first volume of supplements to the reference guide of bands located in Connecticut. The significance of these volumes is that no author has ever documented a half century of the recorded works of an entire state before. I never had the opportunity to check out the first volume however while looking through this supplement I found it to be jam packed with facts, notations, dates, label names and reviews, to mention a few points. It did not come across as just a reference guide because of all the different information offered in the 257 pages. I was impressed with the scope and breadth of this guide. I think every state should have their own official music guide such as this and would be well advised to consider this as a guide or template for creating something similar for their own states. It was long time between the first volume and supplement but I am sure there must be many hours of research and fact finding to put together information for one label never mind hundreds. This supplement cannot be found on a website or Amazon, your typical outlets, you will have to send your in order in via the U.S. Postal Service or email the author to get more information. Details For Purchasing: To U.S. addresses: $54.95; Canada: $59.95; Overseas: $69.95. Prices include postage. Send check/money order with your book order (U.S. funds only) (payable to: PAUL BEZANKER) & mail to: Paul Bezanker, 2603 Kim Miller Rd., Lake Toxaway, NC 28747 or send him an email at PBezanker@aol.com for any inquiries. Keith, I agree - a labor of love and a superb contribution to music history,. By the way, the original book is that same kind of excellent as well. (Truth in advertising: I contributed one of the forewards and my group, The Fabulous Dudes, is also profiled, but it would be worth the raves even if we weren't in it.) Both volumes are labors of love that deserves the love that went into them.